This is not the most recent version. We recommend Rational DOORS Next Generation 6.0.6.1 . This is made available for archival purposes and may contain bugs and/or security vulnerabilities. If you do download this version, it is being provided AS IS, without warranties of any kind, including the implied warranties of merchantability and fitness for a particular purpose. We strongly advise you review the support pages for this version and update the product or take actions recommended therein. Security bulletins contain instructions for the security vulnerability addressed therein, and may require upgrading to a newer version. Link to security vulnerability blog: IBM PSIRT blog. This release provides a more efficient delivery wizard for delivering change sets between different versions (streams), with fewer steps and more efficient use of space for gathering options. Automated conflict resolution now includes an additional option to control the delivery of conflicting changes to primary text. You can now view both versions of the primary text and manually resolve the conflict by editing one of the values. Page and filter controls are also available for large change sets to help manage complex changes. When you compare modules, you can now see a side-by-side comparison of artifacts and filter the view. Support is now available for more use cases around conflict resolution and for the visibility and history of the change sets that have been delivered. The displayed changes are grouped into the following categories: Types, Links, Folders, Artifacts, Tags, and Comments. The new two-way comparison of artifact changes between configurations shows the before and after values to distinguish changes more clearly, and attribute and link changes show more contextual information. The responsiveness of the module editor is now improved. With a transition from pessimistic to optimistic locking, the time to start editing requirements is reduced, including when you work over limited or poorly performing networks. When you review modules, you can now associate review comments with individual requirements instead of the module as a whole. 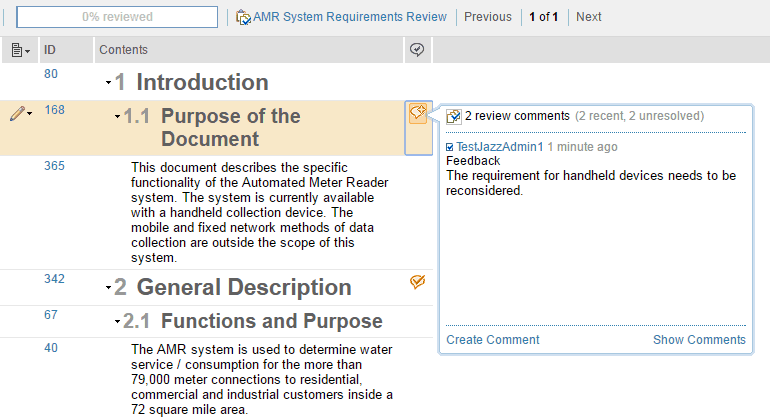 When a module is under review, a new Review Comments column is available. This column is automatically included in the default view for the module. You can add the column to existing views, but it only applies when the module is in review mode. To simplify updating large volumes of information, you can now edit data in bulk within a view. 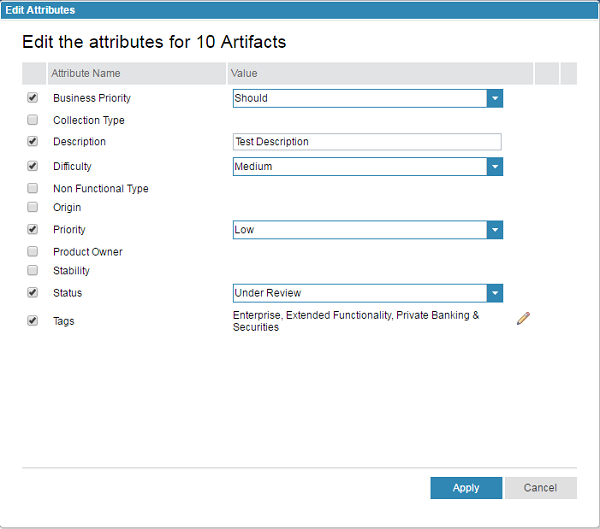 You can use the Edit Attributes dialog box to select the attributes to update for all artifacts in the view. This release introduces an efficient, view-based mechanism to generate documents quickly when you use custom report templates that were created with Rational Publishing Engine. Tests have shown up to a 95% improvement in performance for generating these custom reports. 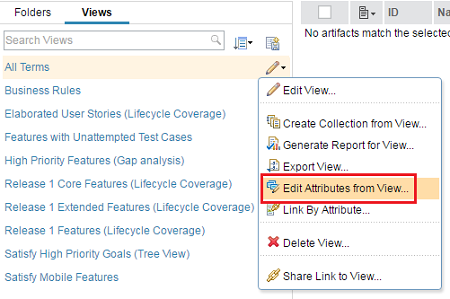 You can create custom reports based on module view filters. When you migrate requirements data from Rational DOORS to Rational DOORS Next Generation, you can increase the value of your requirements data by interpreting each individual "module type"� in the data from Rational DOORS and migrating it to project-wide Rational DOORS Next Generation artifact types. This migration can help reduce the potential for errors in your requirements information and can help with reuse. During migration, a validation process compares before-and-after versions of the data. All reviews, components, and versionable data are validated. You can change the default validation setting to vary the level of validation performed. Details of any errors found are provided in the console window and in log files. After the migration is finished, a validation report is generated that shows how much data was validated, and the number of errors that were found in each baseline and each component in the projects.